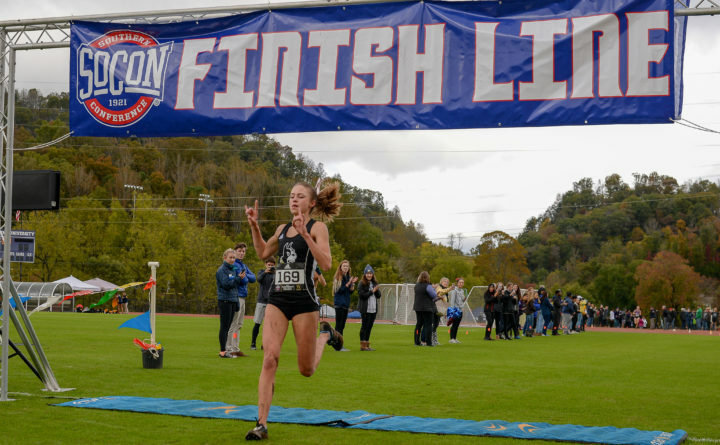 Hannah Steelman, a 2017 Orono High School graduate, crosses the finish line Saturday to win the Southern Conference women's cross country championship as a sophomore at Wofford College in Spartanburg, South Carolina. Former Orono High School distance running standout Hannah Steelman, now a sophomore at Wofford University in Spartanburg, South Carolina, has qualified for the NCAA Division I cross-country championships to be held Nov. 17 at the University of Wisconsin. Steelman followed up her recent victory at the Southern Conference championship meet by placing fourth in the NCAA Southeast Regional held at Winthrop Farms in Rock Hill, South Carolina, on Friday. Steelman finished the 6-kilometer regional race in a school-record time of 19 minutes, 56.5 seconds to qualify for nationals as an individual while leading Wofford’s women’s cross-country team to a 24th-place finish among 33 participating schools. The 2017 Orono High School graduate became the first Wofford runner to win an individual conference championship in cross-country last month when she clocked 17:05.17 over 5 kilometers to win the Southern Conference title. Last spring she qualified for the NCAA Division I outdoor track and field championships in both the steeplechase and the 1,500-meter run. Steelman is the daughter of former University of Maine women’s basketball associate head coach Todd Steelman, who currently serves as assistant coach and recruiting coordinator for the women’s basketball team at the University of West Florida in Pensacola, Florida.